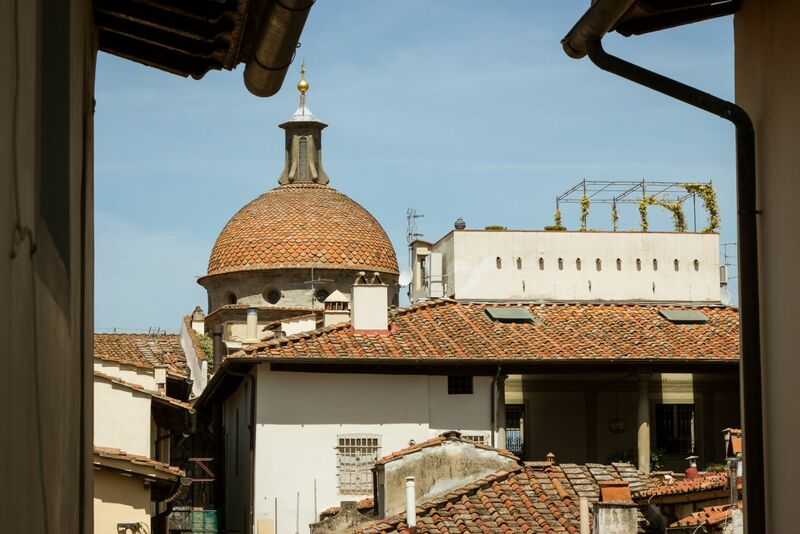 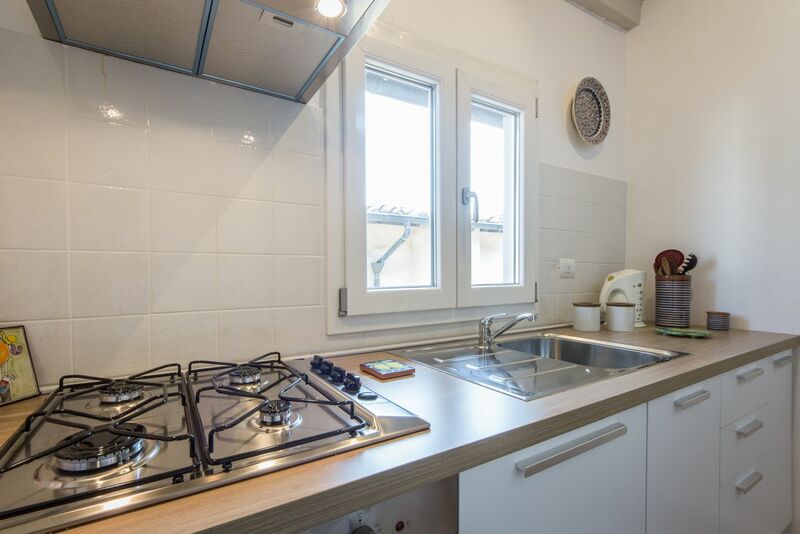 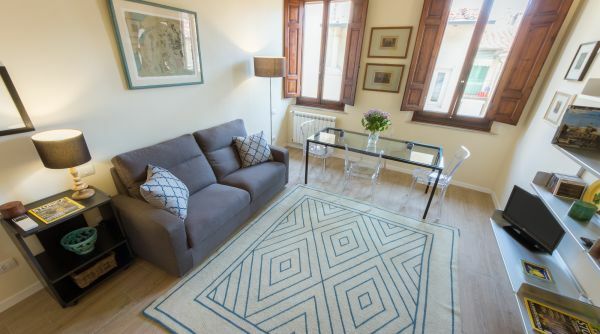 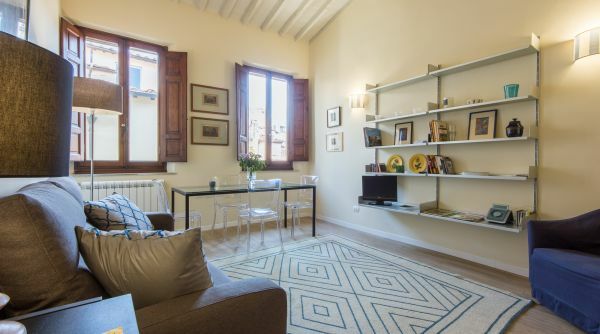 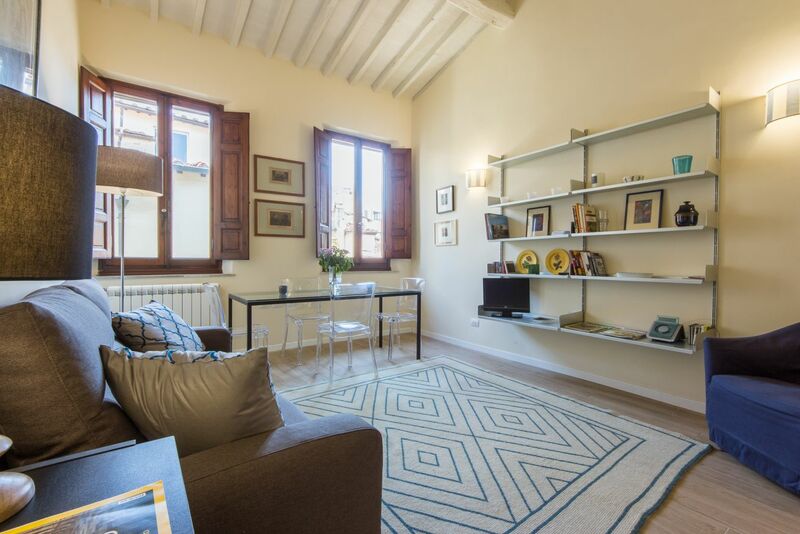 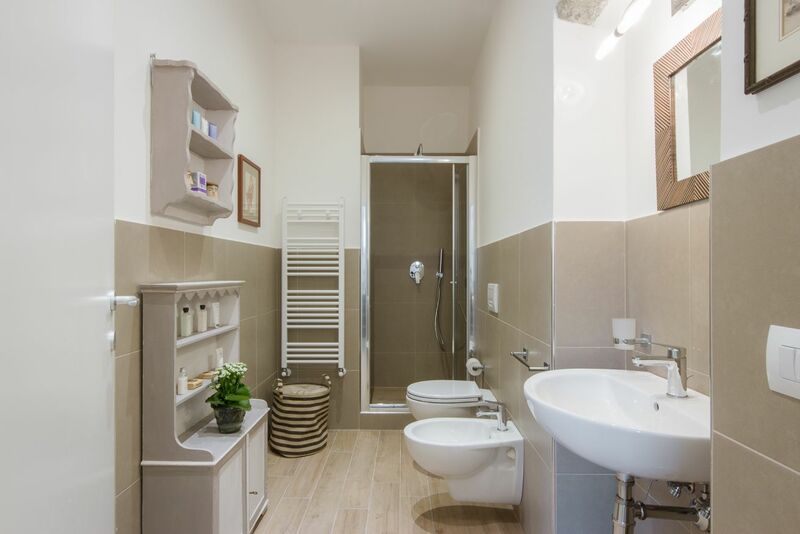 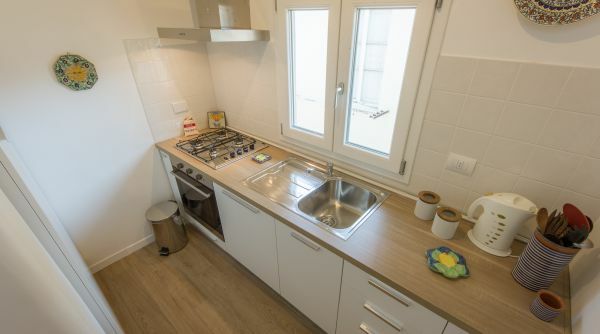 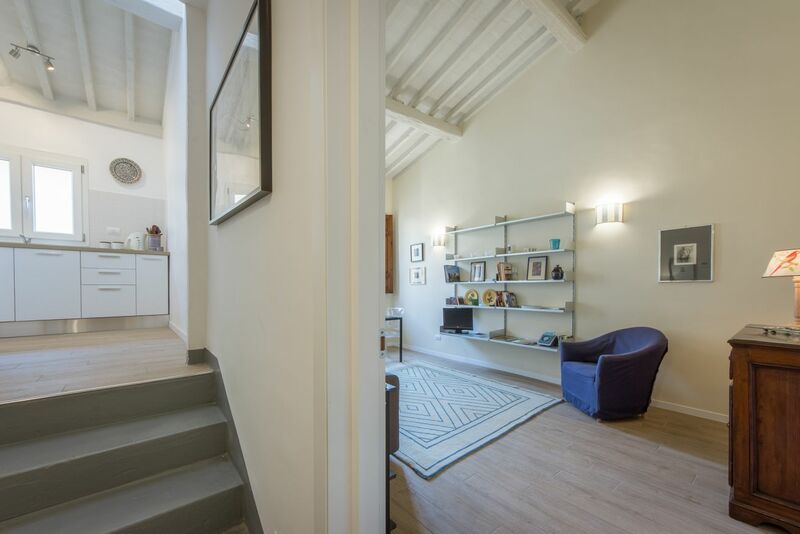 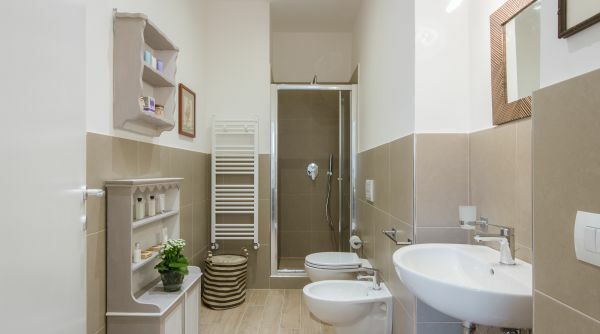 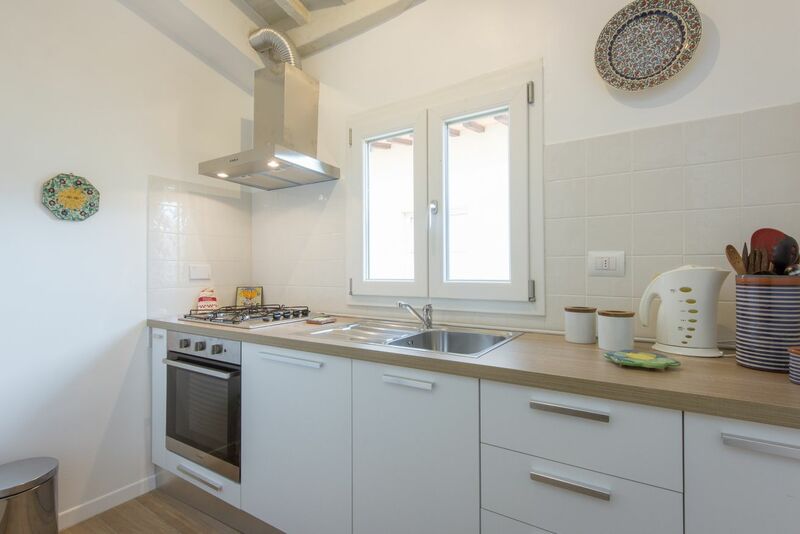 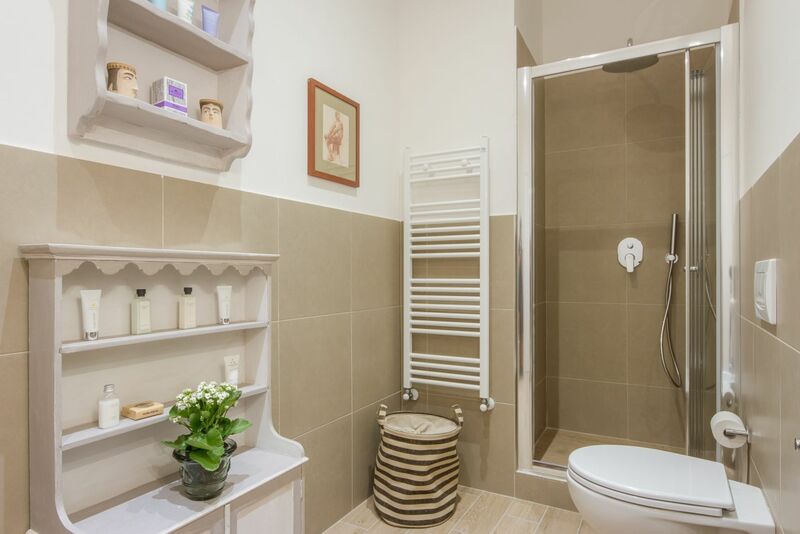 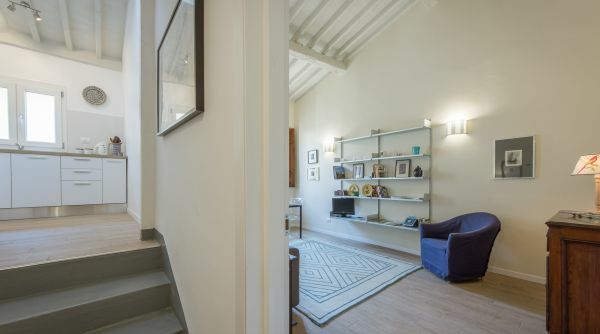 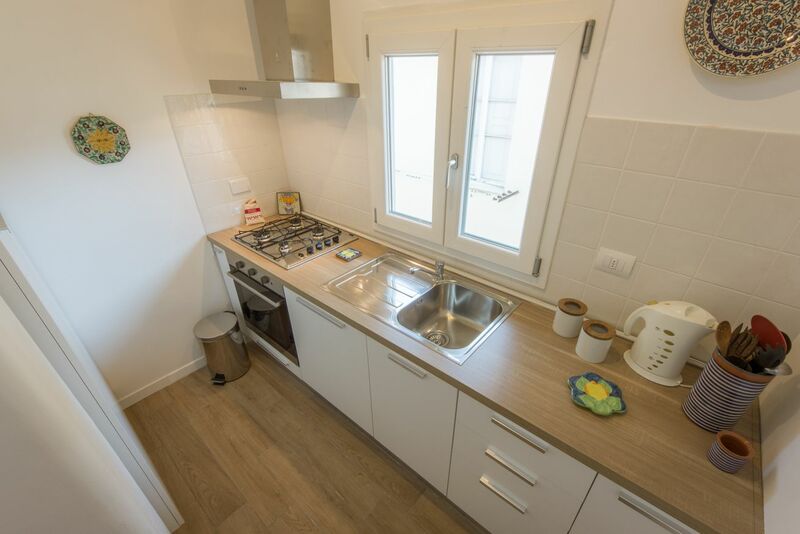 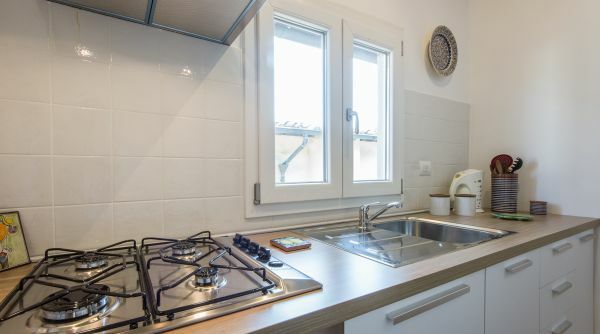 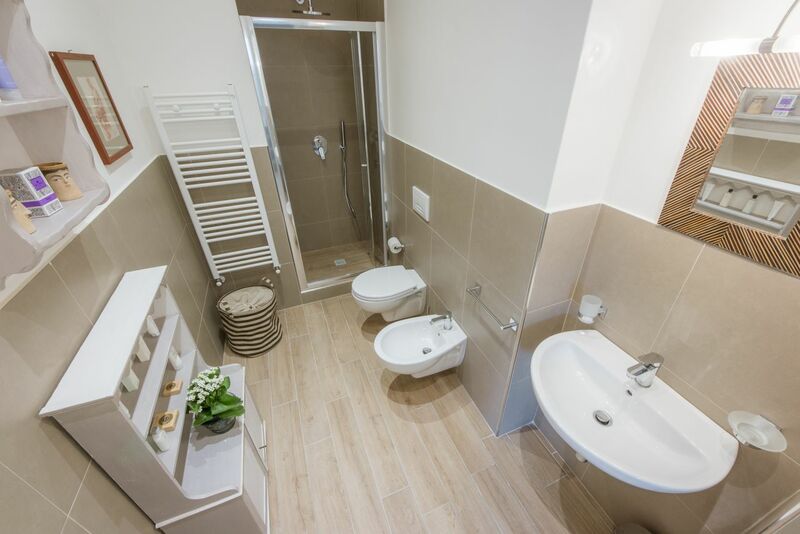 Charming newly renovated 1-bedroom, 1-bathroom apartment located in the heart of the Oltrarno district. 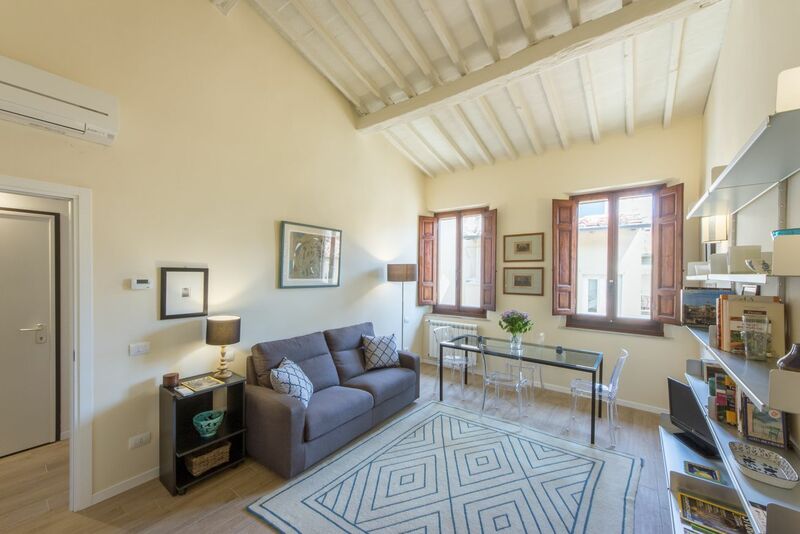 The property is located on the third floor of a historic building from the 1500s. 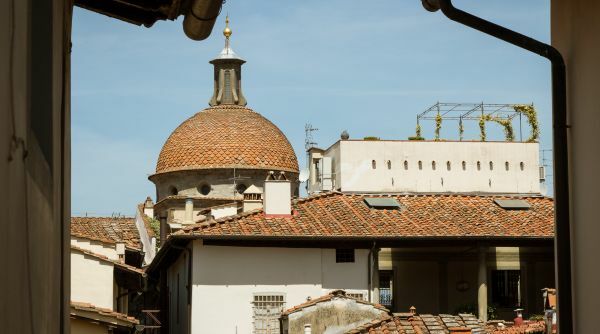 It is on a side street off of Via Guicciardini, where MONNALISA GHERARDINI lived – the person behind Leonardo da Vinci’s inspiration for the world famous Mona Lisa painting. 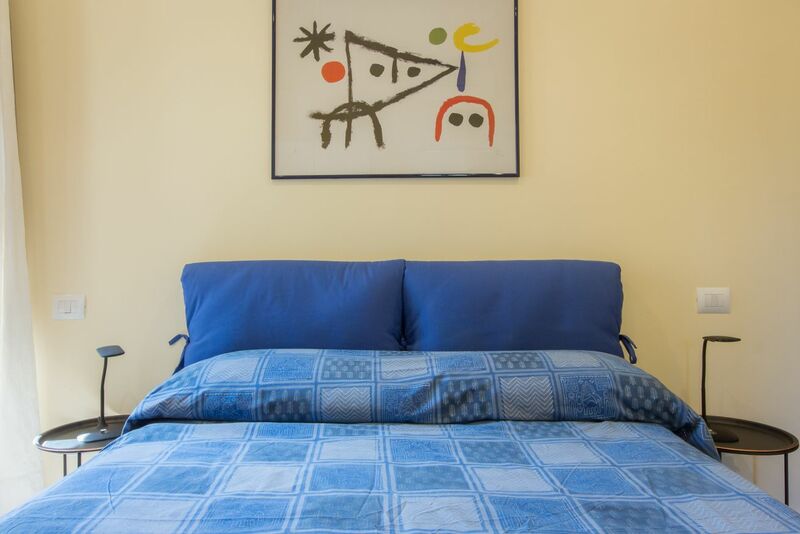 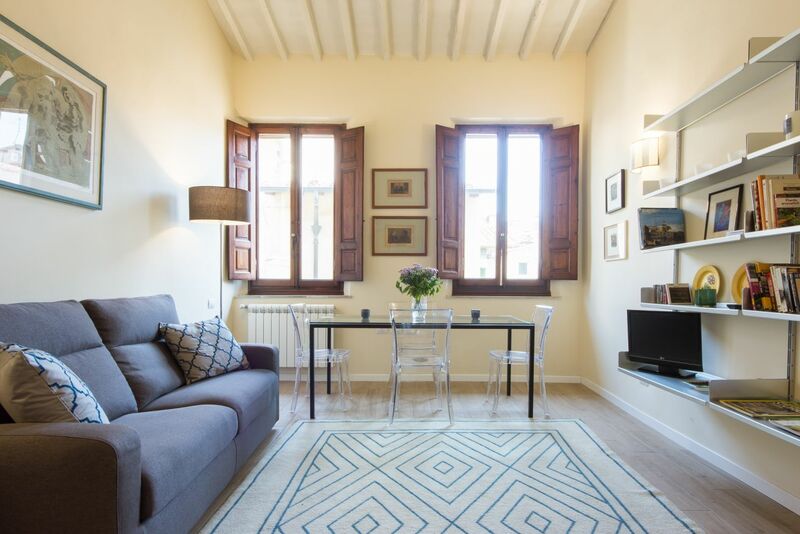 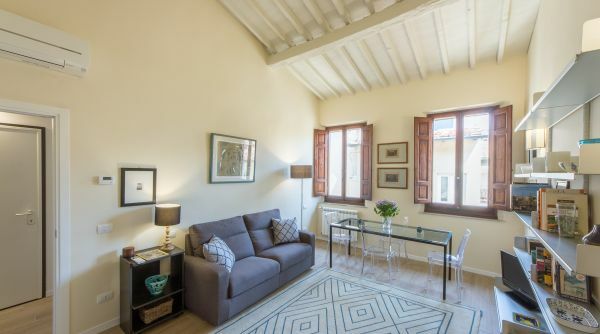 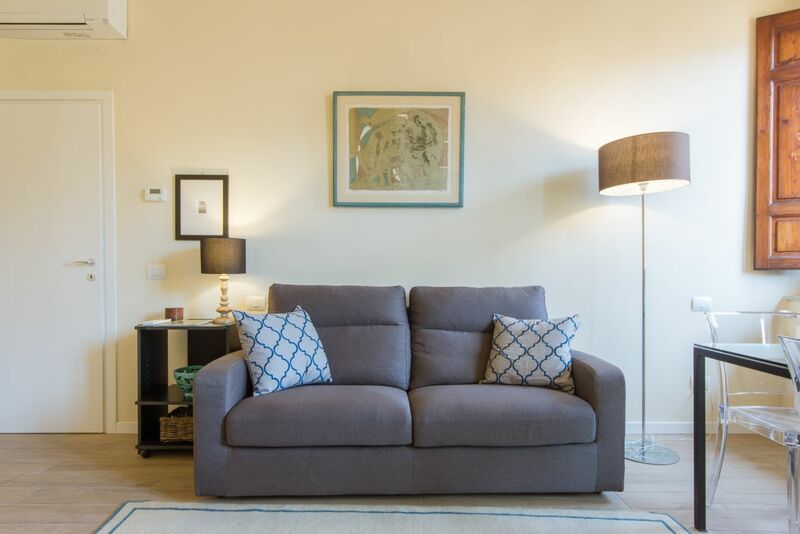 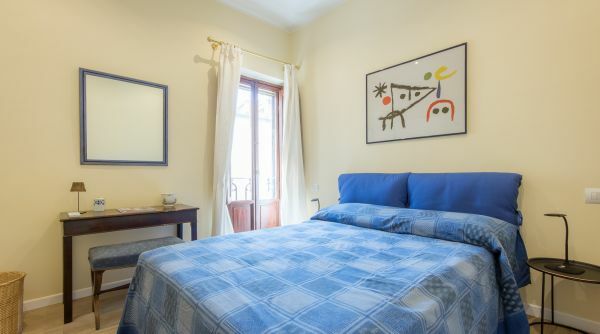 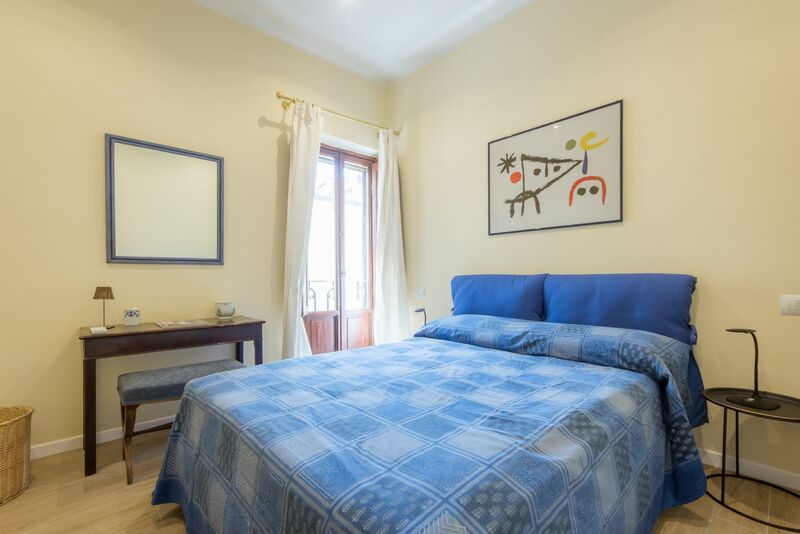 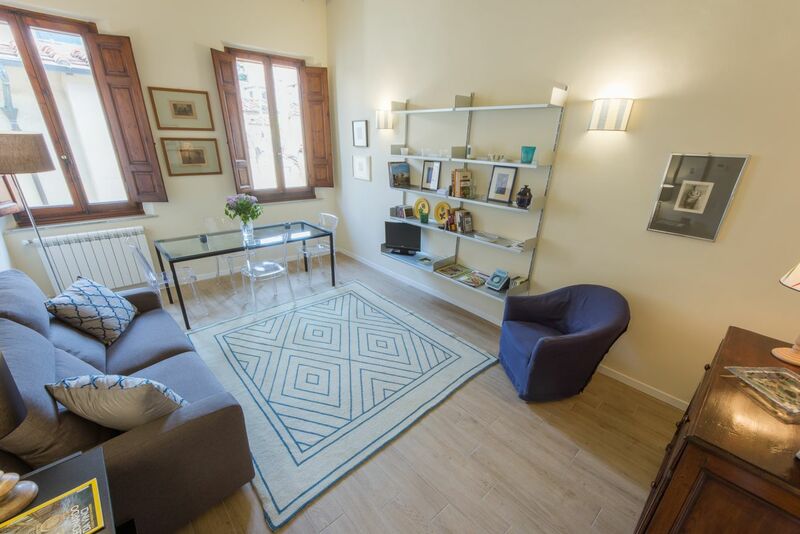 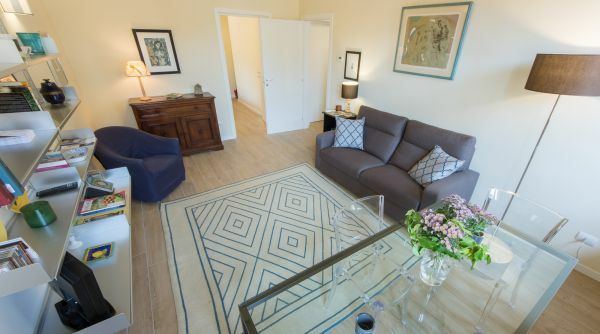 The apartment is near Palazzo Pitti and the wonderful Boboli Gardens - the historic park of the city of Florence and one of the most famous examples of Italian gardens in the world. 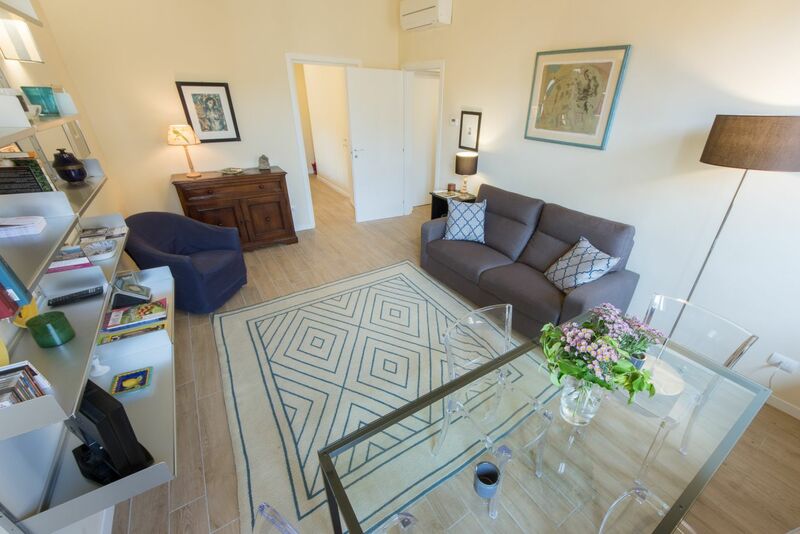 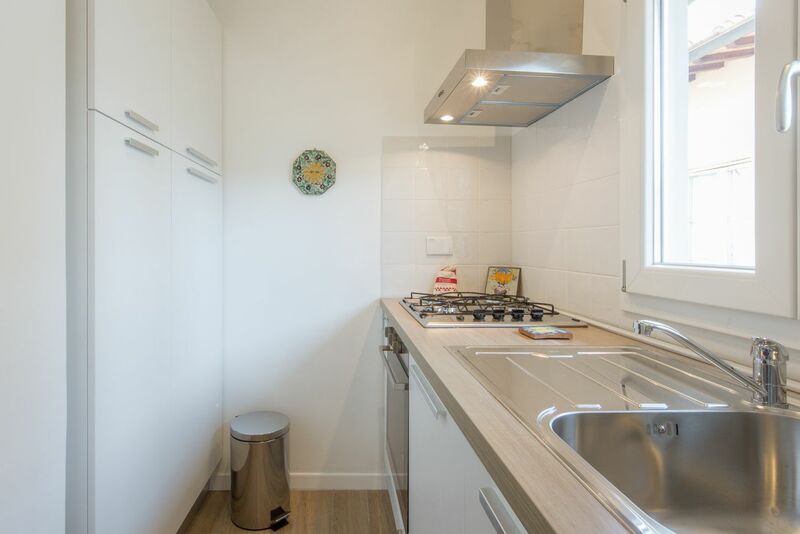 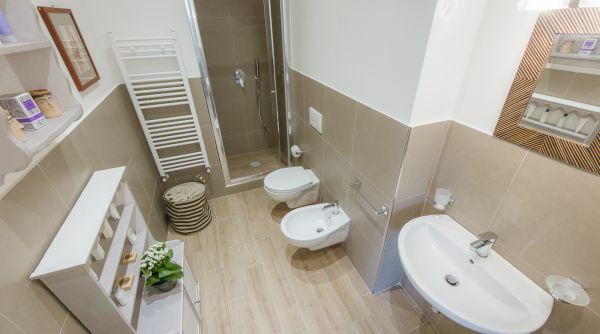 The apartment is completely renovated, and very bright and quiet. 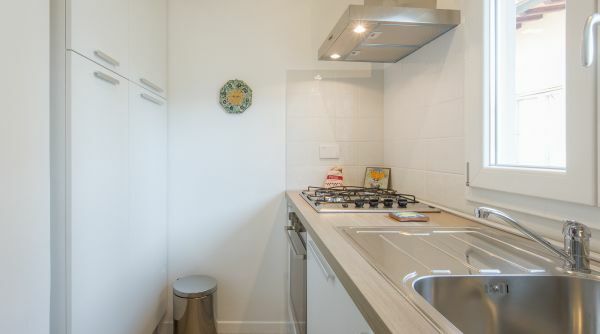 As you enter you will find a small atrium; on the left there is a large modern bathroom with a shower and on the right, up a few step, there is a small, but comfortable kitchen equipped with all the comforts of a real home: a large fridge, oven, washing machine, kettle and everything else necessary to make a delicious meal. 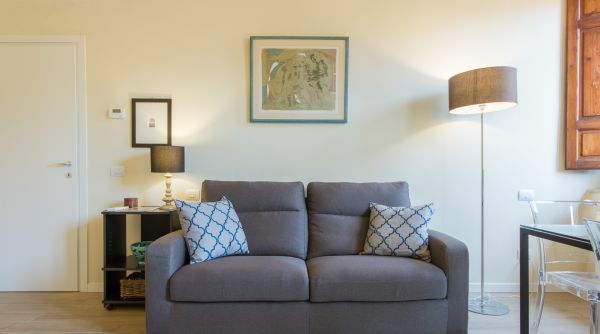 The living room is a bright and welcoming space ideal for a single guest, a family, a couple or a small group of friends. 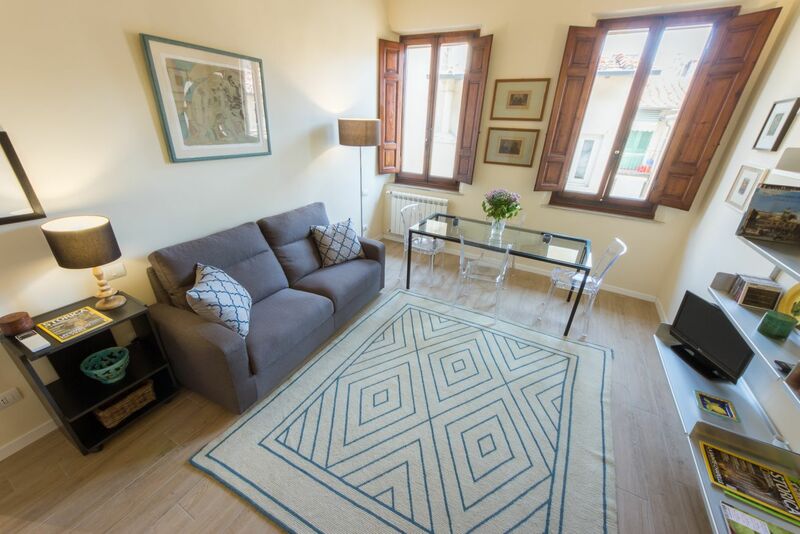 The glass and wrought iron dining table can comfortably accommodate 4 guests. 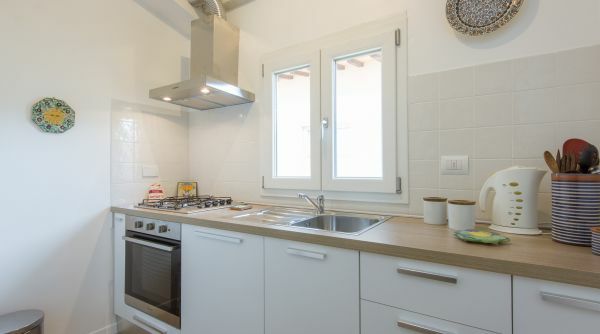 The two large windows let lots of natural light in which contributes to the relaxing and pleasant overall atmosphere. 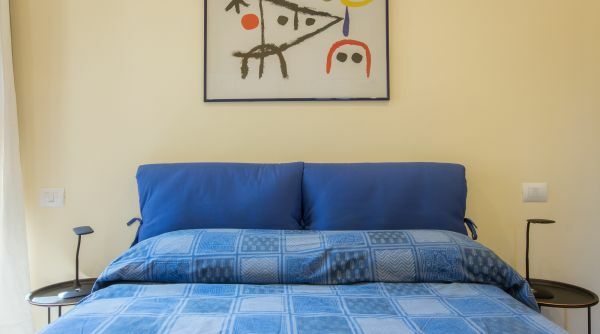 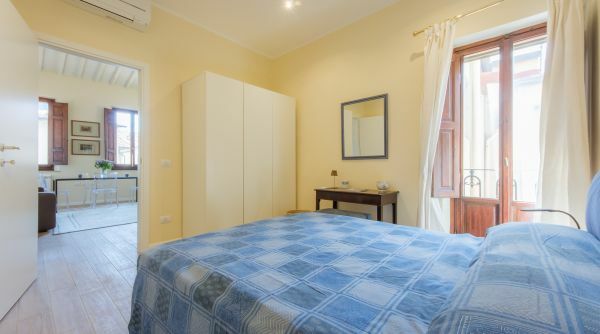 In the living room there is a comfortable double sofa bed, an armchair and a large bookcase – with both Italian and foreign texts and a small collection of Jazz and Classical Music CDs – as well as a TV and a music player. 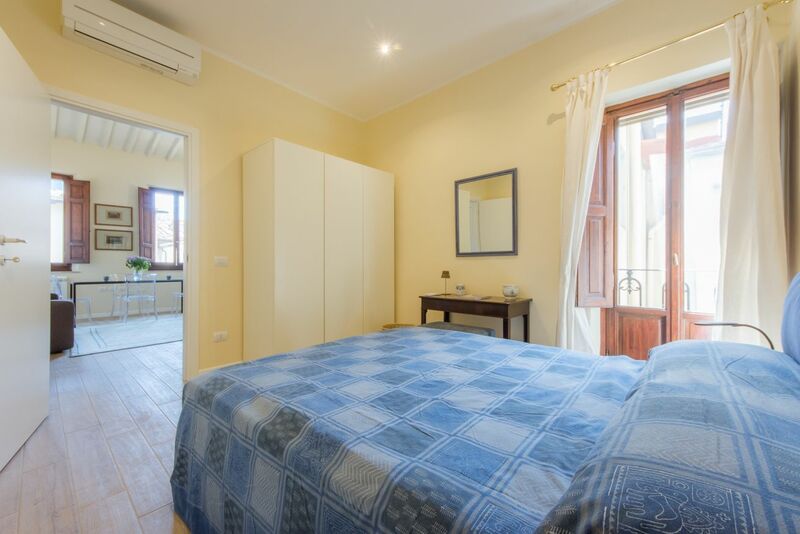 The bedroom is cozy and comfortable with a double bed in the center, a large wardrobe at the foot of the bed and a second wardrobe on the left side of the bed. 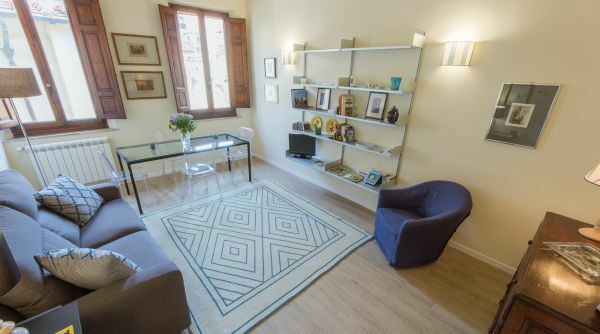 A small desk with abat jour and a mirror above it complete the room. 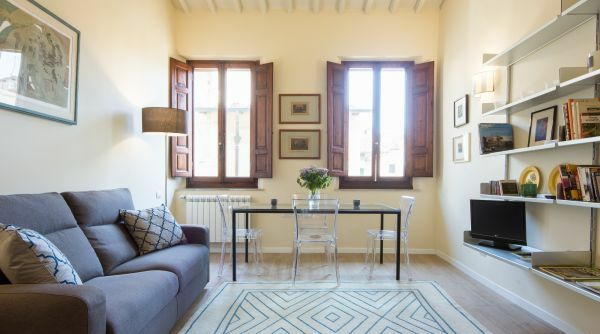 A window door facing the inner courtyard gives the room a unique brightness.